This is a general overview of bees & northern beekeeping. Any friends or neighbours who have expressed an interest in the past about your beekeeping? Let them know. Thanks. Driving from Hwy 11/17 go to Stanley turn-off and approx. one kilometre by the Kam. River. TBBA - Web site COMING- It's different & we want it to be useful. Tell us what you want to see. Other topics of interest - Wintering Basics. Check your top & bottom hive entrances periodically during the winter. Meetings are on the first Tuesday of every other month. No meeting in January & February. July meeting is dedicated to a workshop. Please remember our local Bee Inspectors. Valerie - 767-0582 & Rob - 767-7806, Only a phone call away. Eastern honey bee, Apis Ceranae, cook a giant Japanese hornet using a unique, collective hive defence. This is a wonderful object lesson in the evolutionary power of social insects. Tag alder - male catkins on the right, smaller female catkins on left. 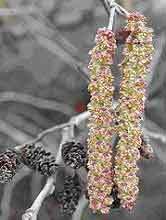 Alders, a relative of the birch family are short, scrubby trees with the unique property of fixing nitrogen from their roots, serving as a "pioneer species" by improving the soil. They are mainly wind-pollinated, but also visited by bees to a small extent - helping to carry the hive during the spring. We have it - It's a Good Thing !! Thanks to the queen mating with multiple drones, each colony is made up of sub families - creating a genetically diverse workforce. As one measure of their fitness, genetically diverse colonies produce 30% more comb !!. And: Our need over the past 15 years to supply queens from among ourselves, avoiding importing the awful mites & other diseases, has created a local Thunder Bay mash-up hybrid of Italian, Carniolan and Buckfast strains. Check any hive for your bee's colour and the mixed parental influence can be seen - bright yellow across the abdomen is the Italian influence while Carniolan is much darker. Intermediate are the Buckfast with several prominent black bands on the front half the abdomen and a dark tail. Take Home Message - We need to work at keeping our own Thunder Bay bees with as diverse as possible local gene pool. When buying local queens see if you can mix-up the source. One year some from Slate River area and another time look to sellers from Rosslyn or Pass Lake. You will be doing both yourself and your neighbouring beekeepers a favour. 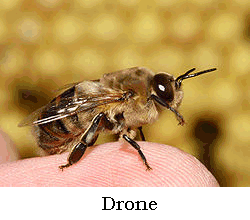 Remember the drones will travel quite a distance to mate, similar to worker's foraging, so we will all benefit. TBBA member, Ean Hays has measured one hive's internal temperature and created a Wintering Temperature Chart for the period from Dec 19, 2009 through Feb 7, 2010. The temperatures are stored in a data logger, at one hour intervals. His hive has a two brood chamber stack, and the cluster probe is down into the top chamber, center frame, by about 5 inches., The outdoor probe is on the north side of the hive, out of the sun. Ean has found a slow drift of temperature from 20 deg C in December to 30 deg C in January. He suspects this is because the bees where clustered in the lower brood chamber in Dec, and moved upwards in January, closer to the probe. So far, Ean's colony seems healthy. At least it is snuggly and warm in there. Feb. 8th they were at 32 deg C at noon hour.Next year, Ean wants to repeat these measurements, with several more probes distributed throughout the hive. TBBA has been invited back to the Thunder Bay Farmer's Market for an Earth Day Display, April 22nd. Last year was the first occasion. Lots of interest and a range of questions from the general public. Very good opportunity to promote our Healthy LOCAL BEES AND USING HONEY. Volunteers take one ~ two hour slots. TBBA member, Barry Taber, Lakeshore Drive, offers a hands-on evening of building "Bee Condos". A small group, drills in hand, prepare wooden blocks as a home for native, solitary bees. Feb. 20th is booked up but if more members are interested another date can be arranged. Brian Biesenthal has created a very nice poster for the Waverley "Catch the Buzz" public presentation. Thanks Brian. !! the industry's trade show in Orlando Florida, 12-16 January, 2010. Market Access/Share (Pure Honey 100% Canadian and its Health benefits). Do bees recognize human faces? Recent news exaggerated honey bee's facial recognition abilities.